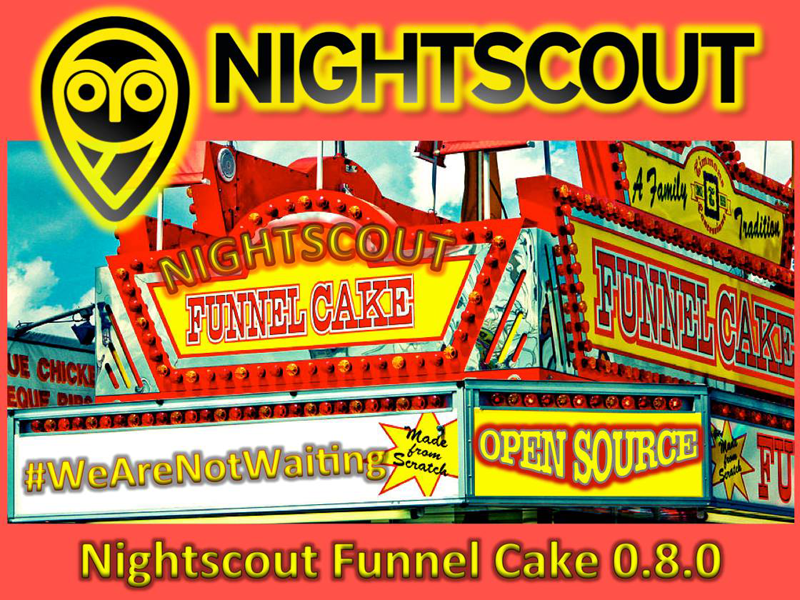 The Funnel Cake (0.8+) update to the Nightscout site represents the most substantial update to date and introduces a number of new features to bring increased management and monitoring capabilities to Nightscout. IMPORTANT: Before you can use Funnel Cake features, you must update your fork and ensure that your website updates to the current version. To update your site code to Funnel Cake, please follow the steps outlined here. Funnel Cake introduces a number of exciting new site features and plugins. Many of these features have to be turned on (enabled) in your site settings before they can be used and before they will be displayed on your Nightscout site. To use features like Care Portal, Insulin-on-Board (IOB), Carbs-on-Board (COB), Cannula Age (CAGE), Raw Data, and the Share2Nightscout Bridge, you must first “ENABLE” them in your site settings (Azure or Heroku). If you have previously set an “ENABLE” value (if you use Care Portal or raw data, for example), you will modify the existing value for ENABLE to add any additional features you wish to use. If you do not have an ENABLE variable set, add ENABLE in the next blank left-hand box (under Configure/App Settings in Azure or in Settings/Config Variables in Heroku) and place selected features from the list below in the value box to its right. You can use chose to enable as many or as few of the plugins as you wish. After you are done, be sure to click “save” to save the settings. Note: you can only have a single ENABLE variable set. All desired features go in the same box as a space delimited list (see examples below). Once plugins are enabled, some of them have pillbox visualizations which can appear as part of your site. In your browser, you can choose which plugins you wish to view by checking the boxes next to the ones you want to see and clicking save. For example, if you enable Carbs-on-Board and choose to display it (in the browser settings panel), you will see a pillbox for COB. At any point, you can open the browser settings panel and turn the visibility of specific plugins on or off. Funnel Cake introduces a new Treatment Profile Editor that makes it easy to create or edit your custom profile. Features like IOB, COB, and BPW rely on individual values set in the Treatment Profile. Funnel Cake adds new support for time-based I:C ratios and basal settings. 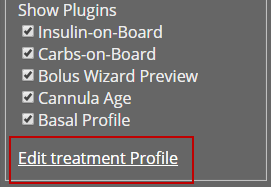 To access the Treatment Profile Editor, click the Site Settings Panel, and click “Edit Treatment Profile” to launch the editor. Additional information regarding the treatment profile editor are here. NOTE: For full directions to set up a Nightscout Bridge site (e.g., you do not yet have a Nightscout site at all), see: General-purpose Nightscout setup, for Dexcom Share, xDrip+, or Spike. The following information is for someone who is updating an existing Nightscout site (with or without bridge) and wants to enable bridge variables. BRIDGE_INTERVAL (Optional: the time to wait between each update. The default is 150000 – 2.5 minutes. BRIDGE_MINUTES (Optional: The time window to search for new data per update. The default is one day in minutes – 1400). To learn more about raw data, see: Interpreting Raw Dexcom Data. When treatment notifications are enabled, your site will generate notifications when a treatment has been entered via Care Portal and will snooze site alarms shortly after. The default snooze duration is 10 minutes. This can be modified by changing the duration using the TREATMENTNOTIFY_SNOOZE_MINS variable in the site settings. Funnel Cake introduces display of current basal rate with pillbox visualization on the site.See Basal. Funnel Cake 0.8.2 introduces basal visualization on the graph, as well as visualization of temp basal settings. See: Basal and Temp Basal in Nightscout. To learn more about AR2, see Forecasting Using AR2 Algorithm. Simple alarms are enabled by default if 1 of the alarm thresholds is set or if the ALARM_TYPES variable includes simple. To learn more about customizing alarms, see Customizing the Alarm Levels. See Pushover information for use with Funnel Cake. For information about using IFTTT with Funnel Cake, see this lab. Many features of Funnel Cake involve making Care Portal entries. If you have not enabled Care Portal in the past and wish to do so now, see CGM Remote Monitor + Care Portal to get started. Funnel Cake supports users around the world with translations of site content in 14 languages. In addition to the variables and plugins defined above, the following variables can be set to further customize your Nightscout site. For each variable below, enter the variable shown in bold in a blank box in your site app settings (or Heroku/configuration variables) and then enter your chosen value in the box to the right of it. Be sure and save after setting or changing variables. The default value for each variable is shown in (). API_SECRET – A secret passphrase that must be at least 12 characters long. An API_SECRET is required for using Care Portal, Pushover, and REST API upload. BG_HIGH (260) – This value must be set using mg/dl units; the high BG outside the target range that is considered urgent. BG_TARGET_TOP (180) – This must be set using mg/dl units; the top of the target range, also used to draw the line on the chart. BG_TARGET_BOTTOM (80) – This must be set using mg/dl units; the bottom of the target range, also used to draw the line on the chart. BG_LOW (55) – This must be set using mg/dl units; the low BG outside the target range that is considered urgent. ALARM_TYPES (simple if any BG_* ENV’s are set, otherwise predict) – Currently 2 alarm types are supported, and can be used independently or combined. The simple alarm type only compares the current BG to BG_ thresholds above, the predict alarm type uses highly tuned formula that forecasts where the BG is going based on it’s trend. predict DOES NOT currently use any of the BG_* ENV’s. BASE_URL – Used for building links to your sites api, ie pushover callbacks, usually the URL of your Nightscout site you may want https:// instead of http://. Setting the following optional variables in your site settings makes your custom settings the default for any instance of Nightscout. The settings panel of the website allows users to override some settings on an individual basis. For each variable below that you wish to set, enter the variable shown in bold in a blank box in your site app settings (or Heroku/configuration variables) and then enter your chosen value in the box to the right of it. LANGUAGE (en) – language of Nighscout. If the language specified is not available English is used. Funnel Cakehas translations available for languages.